Click Timeline for a “FREE” download of this page in PDF format. 44 BC: March; Julius Caesar is assassinated in Rome. His eighteen-year-old great-nephew, Octavian, learns that Caesar adopted him as his son in his will. He heads back to Rome from a military camp in Apollonia, Illyricum (current Albania), where Caesar had sent him and his two best friends, Marcus Agrippa and Gaius Maecenas, for military training and education. Upon his return, the vengeful and cunning Octavian politically attacks Caesar’s enemies for murdering him while, at the same time, he attacks Mark Antony for not doing enough to protect Caesar. 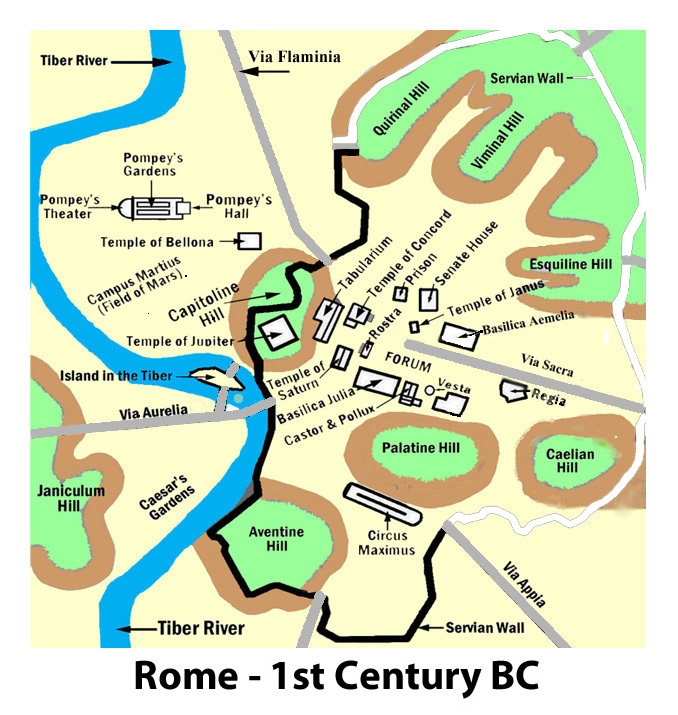 41 BC: February; “The Battle of Perusia” concludes in Italy. Lucius Antonius, the brother of Mark Antony, and Fulvia, the wife of Mark Antony, are defeated. Fulvia flees to Athens. Octavian comes to terms with Lucius Antonius and appoints him magistrate of Spain. 40 BC: September; “The Treaty of Brundisium” is negotiated. Octavian and Mark Antony resolve their differences after the Battle of Perusia. A civil war is avoided. Octavian offers the hand of his sister Octavia in marriage to Antony. He accepts. This brings a period of good will between the two of them. 39 BC: Spring; “The Treaty of Misenum” is finalized after Mark Antony and Octavian meet with Sextus Pompey. An agreement is made that Sextus will stop his piracy and allow the grain ships from the east to sail past Sicily on to Rome. For this, Octavian and Antony make concessions to Sextus on a number of territorial issues. 37 BC: Spring; In the “Treaty of Tarentum,” Octavian and Mark Antony clear up some of their misunderstandings and extend the ‘Second Triumvirate’ for another five years. Later, Mark Antony leaves Octavia for Cleopatra. 36 BC: September; “The Sea Battle of Naulochus” is fought off the northeast coast of Sicily. Sextus Pompey is defeated and his blockade of the grain ships from Egypt is lifted. Sextus escapes to the east and is later killed in battle by an army of Mark Antony. 34 BC: Autumn; “The Donations of Alexandria” are announced by Mark Antony and Cleopatra in Egypt, causing great concern in Rome about Antony’s intentions and loyalties to Rome. 32 BC: November; The Roman Senate, led by Octavian, declares War against Cleopatra and Egypt. 31 BC: September; “The Sea Battle of Actium” is fought off the west coast of Greece. Antony and Cleopatra’s land and sea forces are defeated by Octavian’s forces which are commanded by his childhood friend, Marcus Agrippa. Antony and Cleopatra sail back to Egypt. 30 BC: Summer; Octavian takes Egypt. Antony and Cleopatra are defeated at Alexandria. They commit suicide. 29 BC: Summer; Now the sole ruler, Octavian returns to Rome in total victory. 27 BC: January; Octavian takes the name “Caesar Augustus.” He rules “The Roman Empire” in relative peace for the next forty-two years.